Travelers will tell you that a warm, fresh cookie keeps the weariness at bay while getting checked into a hotel. Supplying the gourmet cookies to hotels and airlines, as well as to the Augusta National Golf Club, helped make Nashville’s Christie Cookie Company an international sensation. When Christie Hauck enrolled at Vanderbilt University, he hoped to help lead the Commodores to a football championship. That sweet taste of victory didn’t happen. Instead, the young defensive back football player discovered his future in a different sweet field – as a popular cookie maker. The story goes that Hauck yearned for the delicious homemade chocolate chip cookies a neighbor had given him as a youngster. Through trial and error, Hauck hit upon a yummy recipe. Of course, his college friends and family were happy to be taste testers for Hauck’s culinary successes. In 1983, Christie Hauck founded Christie Cookie Company as a simple storefront in downtown Nashville. One of his customers was the old Opryland USA Theme Park, which helped introduce more confectionary lovers to the soft and buttery cookies. Before long, the company had expanded into a thriving mail-order business with a faithful following for Christie Cookies in elegant gift packages and personalized corporate tins. Today, the Christie Cookie Company is headed by president Fleming Wilt. Fleming’s father Toby Wilt and Hauck were football teammates at Vanderbilt in the 1960s when Hauck was ranked fifth in school history with 11 career interceptions. Toby Wilt made an early-on investment in his friend’s cookie business, and Fleming Wilt became involved through his father. Now the company produces more than 100 million cookies a year and employs 90 full-time employees, says Caroline Sloan, the company’s marketing manager. “We use the same recipes we started with 35 years ago, using only premium, real ingredients that are hand measured in every batch – no added preservatives or artificial flavors,” Sloan says. A major ingredient in the top-secret recipe is 100 percent pure butter, no cheaper alternatives allowed. No GMO. Chocolate chips come from sustainably farmed cocoa beans, raisins from California, pure bourbon vanilla from Madagascar, the finest brown sugar, cinnamon from Saigon, and exotic macadamia nuts imported from South America and South Africa. That’s why the Christie Cookie logo features a rolling pin and spoon, and the company’s tagline “Hand Crafted. Whole Hearted.” “We love what we do and we make every cookie like we were making it for our own family,” Sloan says. 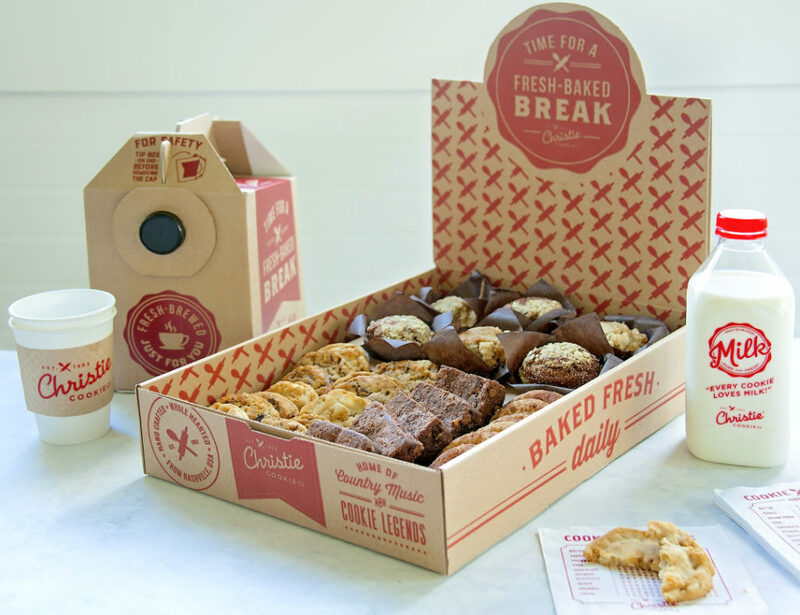 Christie gourmet cookies and brownies are sold directly to consumers through the company website as well as through the two Nashville bakers, a catering division and a corporate gifting division. The company’s foodservice division sells to restaurants, airlines and hotels across the country and internationally. Well-known names where folks enjoy Christie cookies and brownies are Kroger, Pavilions, Tom Thumb, American Airlines and United Airlines. Christie is also the official cookie for the Masters Golf Tournament played every April at the Augusta National Golf Club. “We make a white chocolate pecan cookie exclusively for Masters Golf,” Cano says. Since 1995, guests at Doubletree hotels have enjoyed warm Christie cookies upon arrival. “They are oatmeal-based chocolate chip with walnuts added (along with a few other secret ingredients),” Cano says. There’s a different cookie flavor of the month, including white chocolate cherry, chocolate chunk, peanut butter, snickerdoodle, white chocolate macadamia nut, Southern butter pecan, cran-apple oatmeal, peppermint delight, triple chocolate blonde and more. The best seller? Chocolate chip.